A time of violent social upheaval, Japan enters a new era in the 1860s. Samurai from all walks of life travel to Kyoto in hopes of joining the Shinsengumi, a band of warriors dedicated to the Shogunate bakufu system. In order to avenge her father and brother, Tominaga Sei disguises herself as a boy, takes the name “Kamiya Seizaburo,” and joins the Shinsengumi. Aspiring to be a true bushi (samurai or warrior), Kamiya trains under Okita Soji, the young man she loves and the only person in the Shinsengumi who knows Kamiya’s true identity. Kaze Hikaru, Vol. 23 opens in the aftermath of the surprise attack in which Sei was grievously injured protecting Okita. Okita was under the impression that Sei's injury, a gash on her right shoulder caused by a sword slash, had gotten better, but it seems to have worsen. She is under the care of Matsumoto Hogen, who demands that Okita buck up and marry Sei. Concerned by Sei's injury, Okita tells Hijikata Toshizo, Vice-Captain of the Shinsengumi, that Sei should be removed from the group. Saito Hajime, a rival for Sei's affections who also knows her secret, demands that Okita be a better man worthy of Sei. Meanwhile, Captain Kondo Isami returns from a disappointing trip/mission, while a conspiracy grows within the Shinsengumi. THE LOWDOWN: It has been two years since I have read the Kaze Hikaru manga. I read Vol. 21 because VIZ Media sent me a copy for review, but I did not receive Vol. 22. Quite honestly, I had forgotten about the series, as I usually do. I enjoy reading Kaze Hikaru, but rarely think about it when I am not reading it. Kaze Hikaru Volume 23 finds Sei and Okita growing closer, with Okita struggling to accept that his feelings for Sei as a young woman are refusing to be repressed. At the same time, the samurai drama becomes more intense as the threat within and without the Shinsengumi grows. I often forget that series creator Taeko Watanabe is a woman. I like the samurai drama and intrigue so much that I assume that this series is the work of a male mangaka. Is the fact that she plays the romance as coming out of the samurai setting rather than being the focus the reason that Watanabe has been successful with this series? I don't know, but as the romance rises and the samurai drama does not recede, we may have an answer. 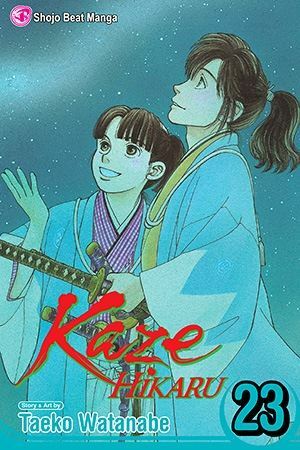 POSSIBLE AUDIENCE: Fans of historical romance and of Japanese historical fiction will like the Shojo Beat title, Kaze Hikaru.